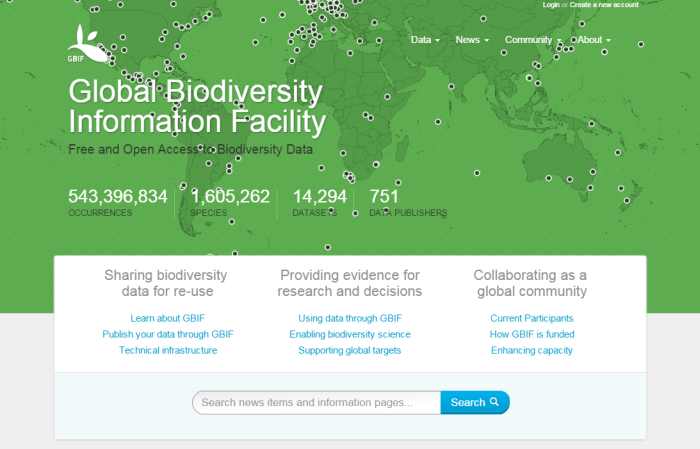 GBIF is an international open data infrastructure, funded by governments. It allows anyone, anywhere to access data about all types of life on Earth, shared across national boundaries via the internet. GBIF operates through a network of nodes, coordinating the biodiversity information facilities of Participant countries and organization, collaborating with each other and the Secretariat to share skills, experiences and technical capacity. GBIF arose from a recommendation in 1999 by the Biodiversity Informatics Subgroup of the Megascience Forum, set up by the Organization for Economic Cooperation and Development (OECD). That recommendation was endorsed by OECD science ministers and in 2001, GBIF was officially established through Memorandum of Understanding between participating governments. ​The GBIF community offers several free to use, open-source tools and services to publish and access GBIF-compliant biodiversity data and metadata. IPT: The Integrated Publishing Toolkit: A free open source software tool used to publish and share biodiversity datasets through the GBIF network. Data validator: A service that allows anyone with a GBIF-relevant dataset to receive a report on the syntactical correctness and the validity of the content contained within the dataset. Suggest a dataset: Share what you know about datasets you’d like GBIF to consider adding. GBIF API: a set of webservices to access data and metadata from GBIF. Data processing: Getting biodiversity data from publisher to user in near-real time. rgbif: An interface to the GBIF API for the R statistical programming environment. MAXENT: Software for modeling species niches and distributions. Tools catalogue: A catalogue listing useful tools. Species matching: Normalize species names from a csv file against the GBIF backbone. Name parser: A simple html form to make use of the GBIF name parser. Sequence ID: This tool will query a blast database of the UNITE Species Hypothesis General FASTA release (a reference database for DNA barcoding of Fungi).